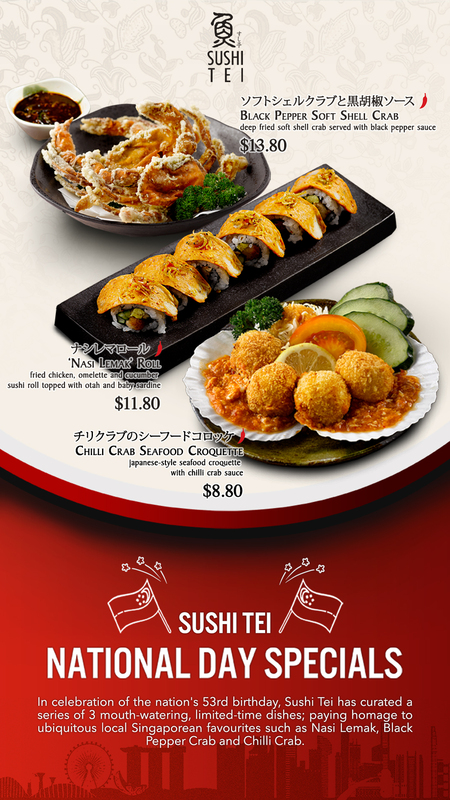 In celebration of the nation’s 53rd birthday, Sushi Tei has curated a series of 3 mouth-watering, limited-edition dishes for its National Day menu. Paying homage to ubiquitous local Singaporean favourites, it is set to hit all Sushi Tei outlets from 27 July to 2 September 2018. The National Day menu selection offers a selection of Japanese interpretations of local Singapore favourites such as Black Pepper Soft Shell Crab ($13.80), Nasi Lemak Roll ($11.80) and Chilli Crab Seafood Croquette ($8.80).